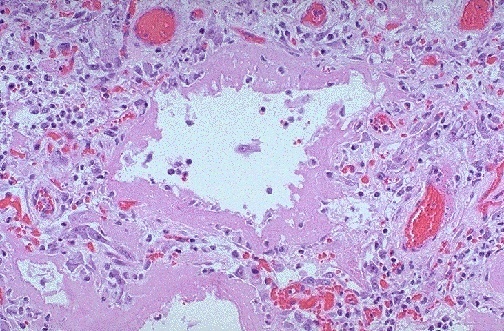 This is the microscopic appearance of diffuse alveolar damage (DAD) in the lung. DAD is simply the final common pathway for a variety of severe lung injuries. In early DAD, there are hyaline membranes lining alveoli. Later, type II pneumonocyte proliferation and then interstitial inflammation and fibrosis are seen. High oxygen tensions needed to treat the hypoxia resulting from DAD and its etiologies further potentiates this disease.